da Garces Ohana In Maui: Why Does It Matter? A man was walking by the beach when he saw this little kid throwing a starfish from the shore back to the ocean. He told the kid that there are literally hundreds of starfish out there and they will simply bake under the heat of the sun and die that it wouldn't matter what he was doing. 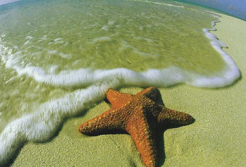 The kid replied as he tossed another starfish towards the ocean "it matters to that one"
Yes the world is like that today with countless unbelievers (starfish) dying spiritually but we can make a difference.